Be your fashionable best with Buccachi's alluring watches. 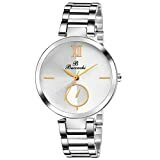 Its features an exquisite pattern on the dial lending it an attractive look. The round dial with analogue display makes it easy to use. These analogue watches will add class to your look with its attractive dial, chain and strap look. The Collection of watches is a perfect blend of style and sophistication. 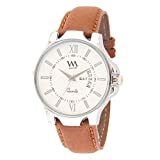 With its big dial and a bracelet strap with buckle clasp, it will surely bring the wearer into spotlight if matched with Informal attire or casual attire.